A holidaymaker said he was "shocked" after finding a stowaway in the back of his car after a trip to France. 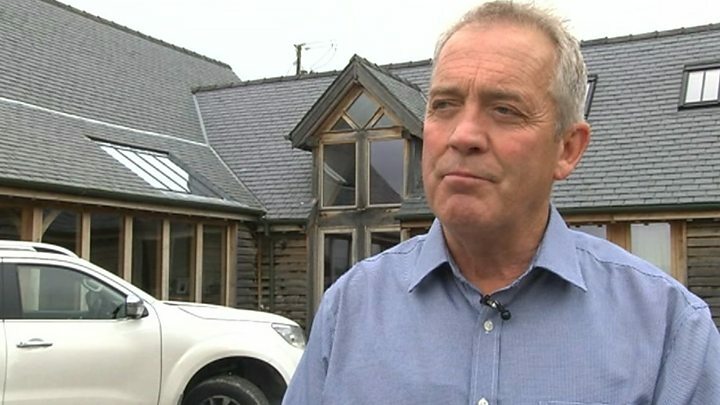 Paul Edmunds found an Ethiopian man in the back of his Nissan pickup after arriving back in mid Wales from a break in France earlier this month. Mr Edmunds had just arrived at his home in Caersws, Powys, and was unpacking when he saw the 22-year-old man's trainers poking out from the luggage. The man was arrested by police on suspicion of entering the UK illegally. The stowaway, who had travelled about 4,000 miles from his home in Africa, was handed over the immigration officers after being contacted by Dyfed-Powys Police at about 17:45 BST on 18 September. "I saw some dirty trainers in the back of vehicle," recalled Mr Edmunds. Media caption'I'm flabbergasted how he got in my car' says Paul Edmunds. "I asked our friends who were travelling with us, if they were their trainers - and then I soon realised the trainers were attached to a pair of legs. "I knew there was somebody in there and immediately I guessed we had a stowaway." Mr Edmunds - who had visited war graves in Arras, northern France, with wife Janet and two friends - had made the five hour journey back to mid-Wales from the Channel Tunnel at Folkestone when he made the discovery in his white Nissan Navara. He thinks the man entered his vehicle at a shopping complex in the French port of Calais or while waiting for the EuroTunnel. "We are flabbergasted as to how he got into the vehicle," said Mr Edmunds. "When we found him, it was pretty alarming to begin with and we called the police. "He was a very placid young man. He was only 18 or 19 years old, I could see he was no bother and then the police came and arrested him." The Home Office said the man will be dealt "according to immigration rules" and while lorry drivers could face fines if stowaway migrants are found, holidaymakers do not.